I am using logitech wireless keyboard K270 and Mouse M185 with my MACbook Air(currently OSX 10.10.5) for more than a year now. All of a sudden today after some time, my keyboard and mouse stopped working. I checked the batteries all seems to be OK. 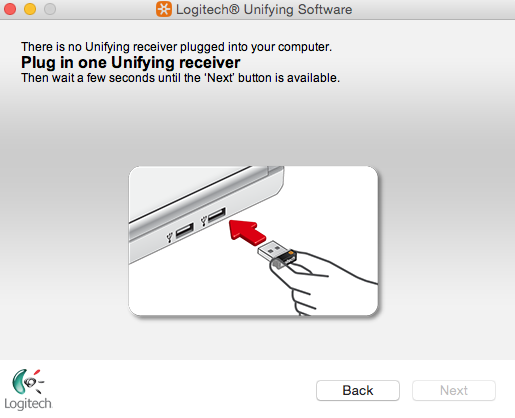 I connected the unifying receiver again after restart with Logitech Unifying software and got this message. The system information is showing that the hardware is not being detected. The drivers are probably fine but idle since they don’t see the USB hardware for Logitech. You can confirm this by removing logitech, then plugging in another usb mouse or something and refreshing the System Information. You should see that device be listed and know your Mac and USB are fine. The fix is to remove the black cover, remove the chip, insert a piece of paper that raises the metal connectors of the chip closer to your laptop's USB connector. Reassemble everything. Once the chip and the USB port are properly touching again you will see the receiver show up in the Mac Systems USB panel and in Logitech Control Center, as others pointed out. You can also look for a visual tutorial of this on youtube / google. As these age, this is, sadly, a widespread problem with the Logitech receiver. Not the answer you're looking for? 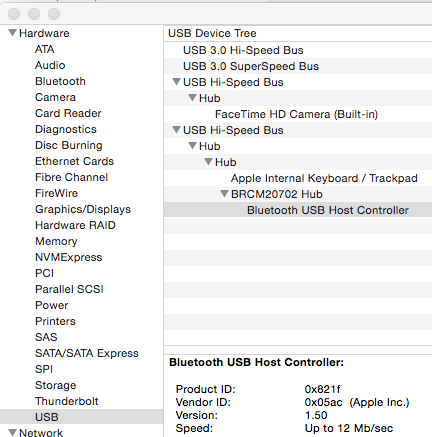 Browse other questions tagged macbook yosemite mouse . Can I use a non-Apple, Bluetooth keyboard with a MacBook Pro?